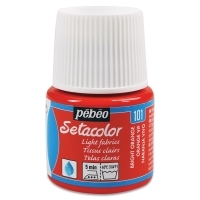 Ready-to-use and highly concentrated, Pebeo Setacolor Fabric Paints create beautiful effects on natural and synthetic fibers. Customize fabrics with patterns and designs. 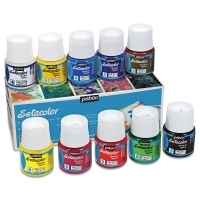 The intense colors mix easily and deliver excellent lightfastness. They don't cause fabrics to stiffen. Opaque colors are ideal for darker fabrics, while Light Fabrics colors are designed for lighter fabrics. Shimmer Opaque colors provide excellent coverage with glittering and iridescent effects. 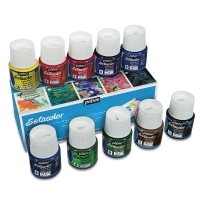 Mediums and Finishes — Create a wide range of effects with these mediums and finishes specially designed Setacolor Fabric Paints. Setacolor Atelier Workbox Set — This innovative set comes in a plastic carrying case that opens into a fully functioning double-layer workbox. It comes with 10, 45 ml (1.5 oz) bottles of Setacolor Fabric Paint, a Squirrel-hair brush, a sponge, a mini palette, a user guide, and a 20 ml (0.68 oz) tube of Setacolor 3-D Glitter in Rich Gold. The fabric paint colors are Buttercup, Cinnamon, Cobalt Blue, Leaf Green, Raspberry, Shimmer Electric Blue, Shimmer Gold, Shimmer Pearl, Vermilion, and White. Opaque Set of 10 — This set includes 45 ml (1.5 oz) bottles of opaque Black, Buttercup, Chocolate, Cobalt Blue, Lemon Yellow, Parma Violet, Raspberry, Spring Green, Vermilion, and White. Light Fabrics Set of 10 — This set includes 45 ml (1.5 oz) bottles of transparent Black, Cardinal Red, Cobalt Blue, Fuchsia, Lemon Yellow, Light Green, Moss Green, Parma Violet, Turquoise, and Velvet Brown. 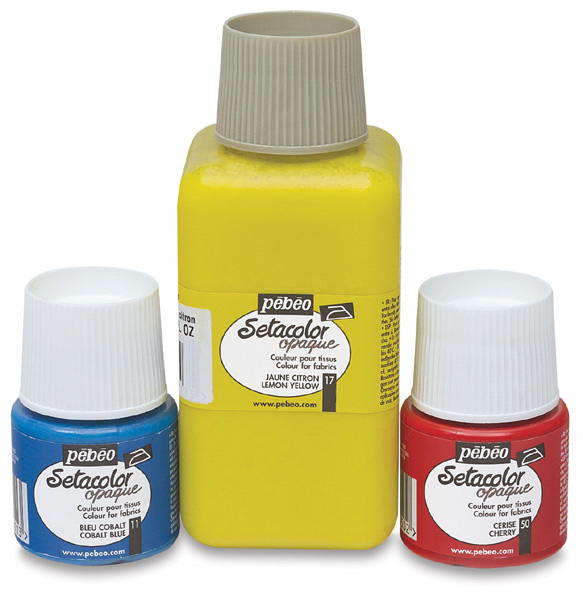 Pebeo's Opaque and Shimmer paints were developed for use on both dark and light fabrics. Available in 40 bright and luminous shades. Watch an example of how to use a stamping technique to apply Pebeo Setacolor to fabric! See how this very unique textile paint can be applied as a traditional fabric paint or can be used in a technique that is specific to this product called Setacolor Soliel Sunprint Technique.